Creating your financial forecast for your business plan can seem like a daunting task. How do you know if you’ve got the right numbers? Are they going to make sense to your investors? Do they meet the standards that lenders and investors expect? Now, LivePlan can help you out with all of that. We’ve expanded our Benchmarks feature to help make sure your forecasts and budgets are similar to other businesses in your industry. LivePlan now includes seven new benchmarks so you can quickly and easily compare your budget and forecast to businesses just like yours. You’ll see how you stack up against the competition, and you’ll be able to determine where you’ll do better, and where you might be falling short. 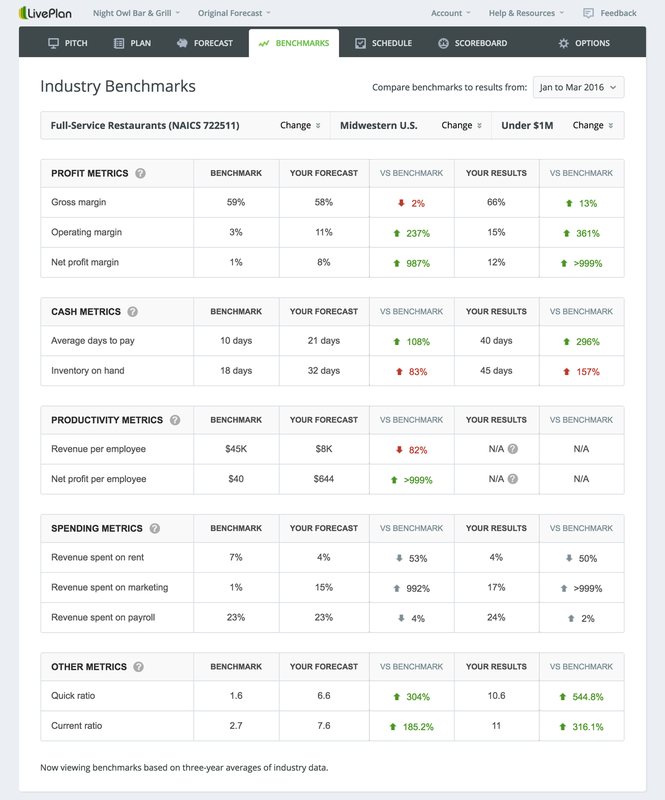 LivePlan’s new Benchmarks feature lets you compare your employees’ productivity to industry averages, so you can see how much revenue each employee should be generating as well as monthly net profit for each employee. You can also see how much your peers spend on rent, marketing, and payroll to make sure your budgets align with industry standards. Finally, you can track your quick and current ratios to measure your overall business health. This is all in addition to the benchmarks LivePlan already includes to help you measure your key profit and cash metrics. As you create your budgets and forecasts for your business plan, you can quickly compare your numbers to industry averages and make changes if that’s the right thing for your business. Remember, though: It’s OK if your business isn’t the same as all of the benchmark data. Not every business is “average” and seeing how your business is different from others will help you prepare for potential investor questions. You’ll be able to explain why your company is different from the average business in your industry, and hopefully explain why you’re better. LivePlan’s new Benchmark features also help you track your performance if you’re already up and running. 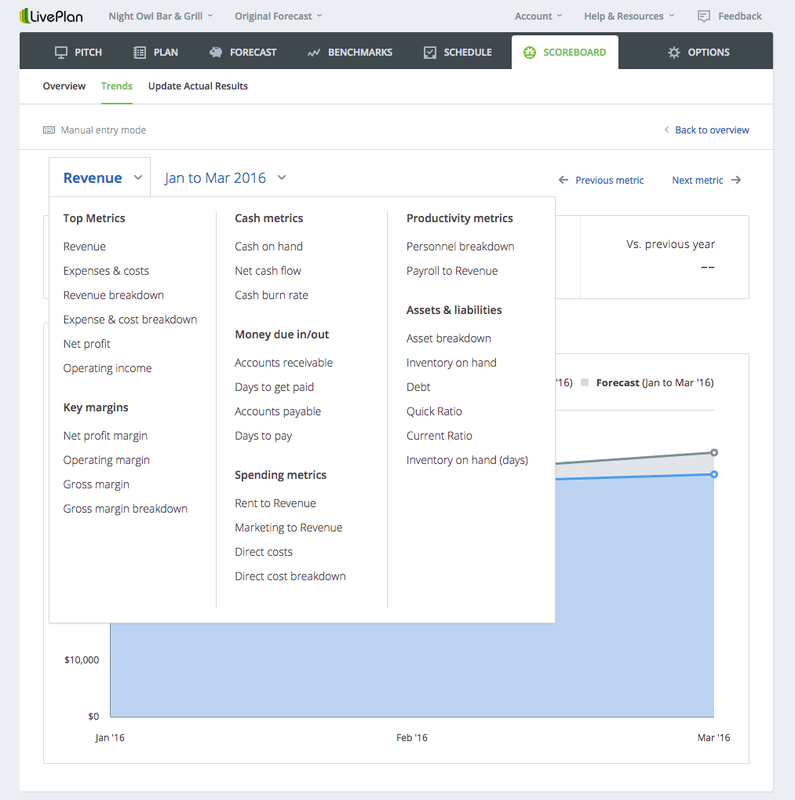 Connect your QuickBooks Online or Xero account to LivePlan and you’ll get an instant comparison to all of our key benchmarks for businesses just like yours. You’ll see how your business compares and be able to adjust course if necessary. Perhaps you’re spending much less in marketing than your competitors or more in rent. You’ll be able to see, at a glance, how you compare so you can plan your strategies for growth. Let us know if you try out our new Benchmarks feature. We’d love to hear your thoughts!